I love putting activities together to go along with books we have read and/or are currently reading; hence my love for using Five in a Row with my oldest for several years. Doing some sort of craft or learning activity based on a book, just makes it come alive in a hands-on way. Another great way to enjoy a book is to re-create it using your own toys! The Happy Man and His Dump Truck was given to me at my oldest son's baby shower! Yes! We have had it for many years and it has been enjoyed by all three kiddos! It is a very cute and simple Golden Book. 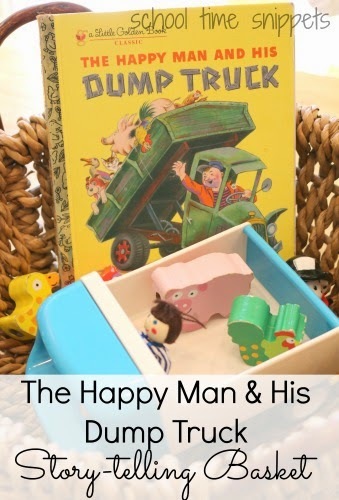 The story line begins with a happy man driving along when he meets a pig who joins the man in his dump truck. As they drive along, the pig sees his friends and asks the man if they can all join him. They continue to drive along and when the man sees a friend, he waves his hand and tips the dumper... all the animals slide down into a big heap. Soon after the man drives them all back to the farm. We re-created the story by making our own Story-telling Basket. I grabbed our blue Kid-O Tip Truck, farm animals from our String a Farm Set, a Fisher Price plastic dog, and a person from other toy we have. 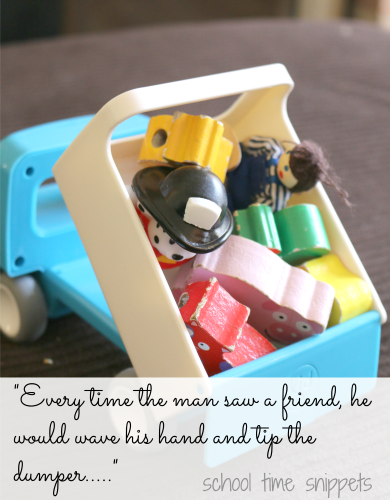 I placed them all in a basket with the book and invited the kiddos to play as I read the story. Another great way to play would be to read the story first and then have your child re-tell the story in their own words using the book. 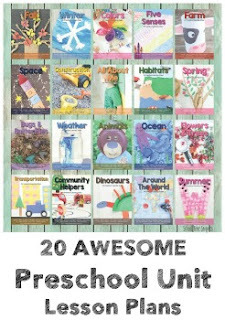 It is a very simple book, so it would be plenty easy for toddlers and preschoolers to join in the fun!